A study has shown that maintaining an active lifestyle during pregnancy can reduce the time spent on labour. There are proven benefits of training during pregnancy, such as relieving back pain, increasing energy levels and getting the body back to normal after giving birth. When you are tired, being active may seem the last thing you need at that point but physical activity can make you relax, keep fit and help you feel more energetic. It can also help your body recover quicker after birth and help prevent postpartum depression. What happens to the body after giving birth? During pregnancy, many changes occur in your body. Keeping your child healthy may seem very difficult. Once the child has come to the world, your body changes again. Some of these changes are physical, for example, the breasts stock up on milk. Other changes are emotional, such as increased stress levels. After birth, it is quite common to suffer from incontinence when you cough hard or move suddenly. There are exercises that can help with this, but tell your doctor about your problem so that he can refer you to a physiotherapist or give you some exercises. Haemorrhoids are also very common after birth, but usually, they disappear within a few days. Eat plenty of fresh fruit, vegetables, salads, whole grains and whole wheat bread and drink plenty of water. This makes it easier for you to walk to the toilet less painfully. Do not try to squeeze them as this will make them worse. Tell your midwife if you’re hurting so they can give you creams to soothe your toilet visits. After pregnancy, many people experience that the stomach is quite relaxed after birth and much larger than before pregnancy. This is partly because your muscles are stretched out. If you eat a balanced diet and exercise, your body shape will gradually return to the stage it was before. What should women eat after giving birth? The key to your energy levels is not just how much (or little) you sleep each night, but instead what you put on your plate. One of the most important factors a healthy diet can do is to give new mothers energy. It is important to spread food intake throughout the day so you receive a steady amount of calories. This will give you long-lasting energy to take care of your child and yourself. Iron, especially if you are affected by postpartum symptoms. You can find iron in things like oatmeal, egg yolks, and lean meats. Vitamin C, which can help mothers who have been given a cesarean section. It exists in oranges, tomatoes and natural fruit juices. How soon after birth can you exercise? You can start doing your pelvic floor exercises as soon as possible after giving birth. In addition, it depends a lot on how active you were during pregnancy and the type of birth you performed. The pelvic floor exercises help you to protect yourself from incontinence. You can also start gently tightening your abs to help them regain strength. If you do regular exercise throughout the pregnancy and you did a relatively normal birth, you can continue with light exercise and stretching right after birth if you feel ready. Always have control over how you feel and how much energy you have. Note that all mothers have different births and it is recommended not to compare yourself with other mothers. Always be aware of your condition before you start exercising; It may be important to consult both midwives and doctors before starting a postnatal activity. Pregnancy hormones and breastfeeding can affect your joints for months after birth, so be careful not to exercise too much too early. Although training can feel like the last thing you want to do as a new mother, it still has its benefits. Carefully perform stomach and pelvic floor exercises necessary to help your body return to its previous stage. How long for your stomach to get back to normal after giving birth? After a few months, you should begin to notice results. You should continue to exercise even when you notice that it is starting to work. It takes time for your body – especially your stomach – to return back to normal. Imagine your stomach as a balloon that slowly inflates while your baby is growing. Birth does not break the balloon; it only starts to leak slowly. But just calm down – the stomach will contract again. From the moment the baby is born, hormonal changes occur, causing the uterus to contract and shrink back to its original state. It takes up to six to eight weeks before the uterus returns to its normal size. You can start this movement as early as one week after birth if you performed a vaginal birth. If, on the other hand, you had a caesarean section, you might have to wait 8 to 10 weeks. Lie on your back with your knees bent with a pillow under your hips and another pillow between your knees. Lay flat and hold your arms on each side, breathe in, and then breathe out. Tighten your abdominal muscles and hold your chest down and tighten the buttocks. Hold the buckle for 5 seconds and it is up to you how many repetitions you are ready to complete. Add this exercise to your training routine after six weeks. Lie flat on your back with your feet hip-width apart and have your knees bent. Breathe in and then out while tightening the abdominal muscles up and into the spine. Lift up your pelvis, lift your hips from the floor to a bridge. Slowly lower to the starting position. Repeat this 5 times and increase to 10. Lie on your back, with your knees bent. Place a towel over the thighs and grab each end. Pull the ends of the towel and tighten the thighs together. Inhale and exhale as you tighten your abdominal muscles and lift your shoulders away from the floor. Hold on to the towel, tighten the muscles and relax your muscles 10 to 12 times. Work up to 20 repetitions over time. Do this movement 1-4 times over two weeks. Lie on your back with your knees bent, your feet hip-width apart and bent. Tighten the left foot, press the heel into the floor. Hold the pelvis still, breathe in and out when using the muscles to push the left heel away from your body and keep your knee slightly bent. Back to start position. Change sides, make 5 slides on each side and work your way up to 10 repetitions. Do these first three exercises for the next two weeks and then add 4. Lie on your back with your legs bent and your legs flat on the floor. Lift your shoulders off the floor and look down on your stomach. Use the fingertips between the edges of the abdominal muscles, above and below the navel. See how many fingers you can fit between the slit in your muscles. Do it regularly to check that the hole is gradually falling. The separation between your abdominal muscles will usually return to normal when your baby is eight weeks old. If the distance is still apparent after eight weeks, the muscles may still be long and weak. This can put you at risk for back problems, so we recommend that you always consult a doctor to help you control the conditions. Is it safe to train soon after giving birth? Before you start any form of exercise, we always recommend talking with a doctor first. There may be cases where it is not an advantage for you to start your workout so we recommend that you try some of these exercises. 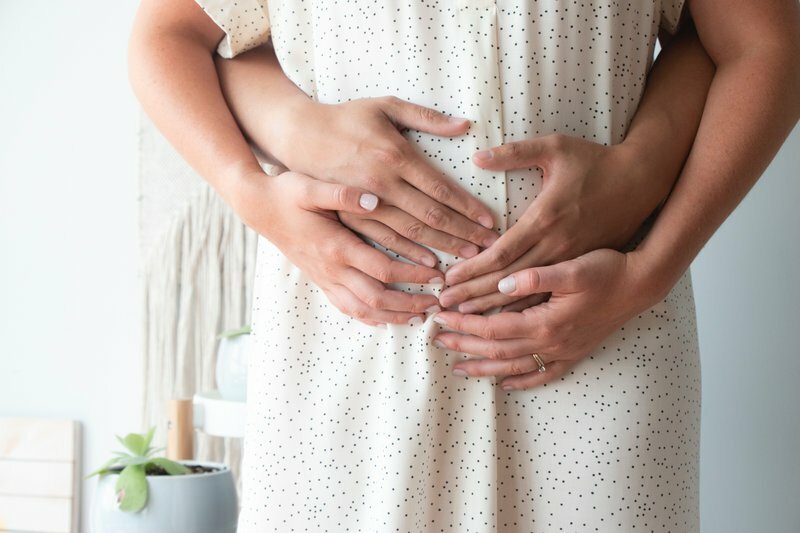 It is important to note that all women experience both pregnancy and postnatality differently, so it is important to take certain precautions. Many women have to wait longer than others, in case of complicated birth, before starting physical activity.